From the Disc 2 main menu go to "News From The Front". Highlight "About The Footage" then press the down arrow. A dot appears between the hands. Press enter to see a French TV clip of director Volker Schlondorff meeting Jerry Lewis. 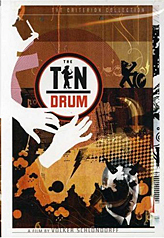 From the Disc 2 main menu, go to "Volker Schlondorff Remembers The Tin Drum". Highlight "Main" then press the down arrow. A dot appears between the hands. Press enter to see a photo of director Schlondorff in front of the Hollywood sign holding his Oscar.